If one thinks of Henri Le Secq, one realizes that sequentiality, discontinuity and the fragmentation of the subject became part of the discourse of photography as he decomposed and recomposed the principal French cathedrals Rheims, Chartres and Amiens, Strasbourg from 1848 to 1853, during the earliest years of the art form. A generation after this project, which was intended to re-present art and history to a society enmeshed in a drastically changing order, the modalities of representation had become the tools through which Evelyn George Carey would prove the grandeur and viability of the gigantesque forms and organizational élan of the new order. The images he made of the total process of constructing the Forth Rail Bridge were intended to redeem the formerly pre-eminent reputation of British engineering, which had suffered in the wake of the collapse of the Tay bridge in 1879, a suspension bridge as was the original Forth Bridge design. A young engineer in the office of Sir John Fowler and Benjamin Baker who redesigned the span as a series of three cantilevers, Carey approached the photographic enterprise from an engineer's understanding. 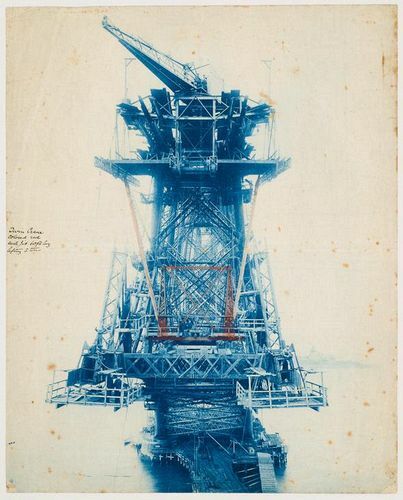 Given privileged access to the construction site, Carey was able to make unique images as he was swung into place and climbed scaffolding carrying an 8 Î 10 inch view camera and the equipment necessary to expose glass plate negatives while standing on temporary platforms. From one cantilever to the next, Carey captured extraordinary views of these structures, whose towers would rise to a height greater than the pyramid of Cheops. Hundreds of numbered and dated albumen prints evoke an organic process as the structure unfolds, from 7 March 1887 to 17 June 1889, according te the speed and time established by the intervals of photographing the growth of the structure. Again a generation later, the idea that the quantity of interval determines the pressure of interpretation and reception, recognized by Sergei Eisenstein in the theory and practice of film montage, led to a new expression of photography. Astounding in themselves, Carey's images, including the cyanotypes the blueprint of architects and engineers permitting annotation such as the demarcation of the crane in the image reproduced here are themselves a bridge as they span the key interval in the conceptualization of motion in architectural representation.